These Powerball winners touched all the bases, capping off a birthday trip to Fenway Park with a $50,000 grand slam! 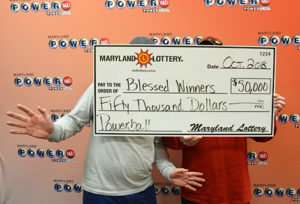 A dynamic duo arrived at Lottery headquarters this week to claim one of a series of $50,000 Powerball prizes from October’s dual jackpot frenzy. The two government employees managed the feat by matching four numbers and the Powerball for a third-tier win in the Oct. 24 drawing! The lucky pair from St. Mary’s County are on a quest to visit all of the incredible major league baseball stadiums around the country. Early this week, they were returning from a birthday trip to Boston and a tour of historic Fenway Park when the crack of the bat came in the form of a lucky Lottery ticket. They bought a quick-pick ticket while at the Wawa on Three Notch Road in Mechanicsville. Less than 24 hours later, the “Blessed Winners” recounted their path to Powerball riches to Lottery officials. Each of them parlayed a bit of luck into their Powerball hit. They chipped in for the purchase using prizes from earlier wins. During the trip, one of them fished out the lucky Powerball ticket and checked it using the My Lottery Rewards app. After aligning the ticket’s Prize Check QR code with their camera, their smartphone screen displayed a “Congratulations” message followed by lots of zeroes! In addition to visiting the stadium of their hometown favorite, the Washington Nationals, the winners have visited baseball parks for the Colorado Rockies, Houston Astros, Texas Rangers and Atlanta Braves. They have just started thinking about how to spend the winnings and initial plans include more travel and another big birthday celebration. This entry was posted on November 5, 2018 at 7:37 am and is filed under All News, County, Good News, More News, St. Mary's News, z 600X120 Top Ad Bottom, z 600X120 Top Ad Top. You can follow any responses to this entry through the RSS 2.0 feed.